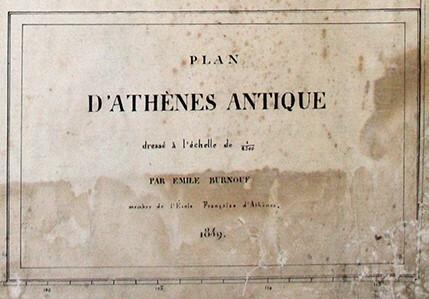 The treatise of the French archaeologist Émile Burnouf on the Western Hills of Athens entitled “Note on the drawing of ancient Athens" (1856) is available in Greek translation, undertaken by the Dipylon members Maria Mourkousi and Despina Alexandri. In 1849, during his two-month stay in Athens, Burnouf dwelled “upon the rocky hills bearing, more than any other site, the traces of the ancient inhabitants of the city”. More information as well as the text of Burnouf’s treatise, together with the maps he created, can be found in the relevant page.